On the 2nd December we are unable to meet at Investigator College. So we’re moving for the day! We will meet at the normal time, 10am, at the Encounter Hall, 13 Leworthy St, Victor Harbor. As it’s the first Sunday of the month, we’ll have our usual lunch together after the service. 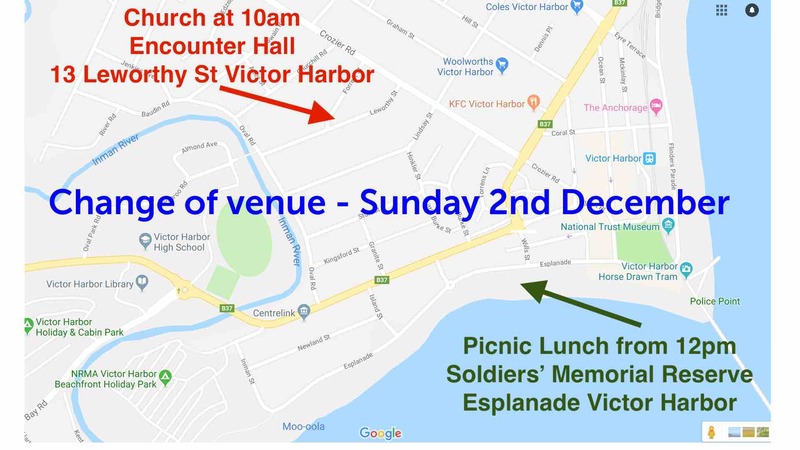 However, we’ll take the opportunity, weather permitting, to have a picnic lunch at the Soldiers Memorial Reserve on the Esplanade (near Hotel Victor). There are public BBQs we can use, as well as a kids playground and plenty of space to run around. BYO everything!